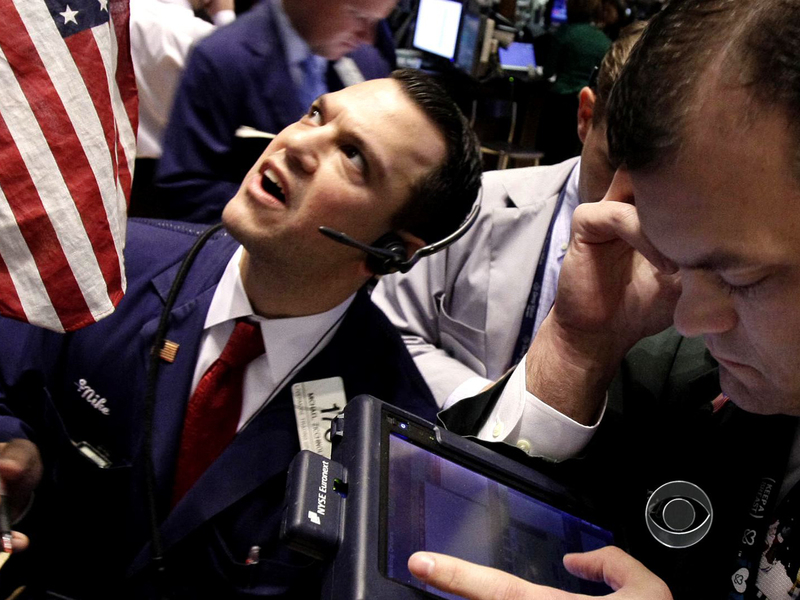 (CBS/AP) NEW YORK — News that Spain's economy entered another recession renewed worries about the fragility of Europe's finances Monday and nudged stocks lower. The market ended its first losing month this year. The Standard & Poor's 500 index slipped 5.45 points to close at 1,397.91. For April, it was down 0.8 percent, its first month in the red since November. The Spanish government said that the country's economy shrank in the first three months of the year, the second straight quarter of contraction. The worry is that Spain's heft could make it difficult to rescue. Its economy is roughly twice the size of the three other countries that have tapped the European Union for bailout loans added together -- Greece, Portugal and Ireland. In the U.S., a drop in an index of Midwestern manufacturing and a slowdown in consumer spending last month added to worries that the economy is losing steam. The Institute for Supply Management said its Chicago business barometer fell in April to the lowest level in more than two years. Coming after two other weak readings for the regions around New York and Philadelphia, the market reaction to the Chicago report could have been much worse, said Clark Yingst, chief market analyst at the brokerage Joseph Gunnar. "It's very bad news in my opinion," Yingst said. "I'd have thought the market would come under more pressure than it has." Weaker earnings reports from health insurer Humana and the owner of the New York Stock Exchange, NYSE Euronext, also weighed on stock indexes. The Dow Jones industrial average slipped 14.68 points to close at 13,213.63, narrowly avoiding its first monthly loss since September. The Nasdaq composite fell 22.84 points to 3,046.36. It posted a monthly loss of 1.5 percent. Growing concerns about Spain knocked European markets lower on Monday. Spain's main stock index, the IBEX 35, sank 1.9 percent. France's CAC-40 lost 1.6 percent. The dollar and U.S. Treasury prices edged up as investors parked money in low-risk assets. Ratings agency Standard & Poor's downgraded Spain's government debt to just three notches above junk Friday. On Monday S&P lowered its rating for 11 Spanish banks, which are loaded with bad debt from a collapsed housing market.